The standard of care and record of leadership at the Center for Telehealth has led to UMMC being named a Telehealth Center of Excellence. JACKSON, Miss. — For 14 years, the Center for Telehealth at the University of Mississippi Medical Center has been a national trailblazer in providing high-quality health care, especially for those with little access to both primary and specialty services. Its leadership, body of work and mastery of telecommunications technology is being recognized by the federal Health Resources and Services Administration. The Medical Center has been designated one of two Telehealth Centers of Excellence, the agency’s top award given only to programs at public academic medical centers. “The University of Mississippi Medical Center’s successful program is already a model for national telehealth expansion,” said U.S. Sen. Thad Cochran, R-Miss. “As a Center of Excellence, UMMC will be able to demonstrate to a broader audience how to use telehealth to increase patient access to care and decrease costs. The recognition from the Health Resources and Services Administration, an agency of the U.S. Department of Health and Human Services, was announced during an Oct. 5 news conference in Washington. It includes an initial $600,000 in funding, with the opportunity for an additional $2 million over two years. The designation allows UMMC’s Center for Telehealth to serve as a national clearinghouse for telehealth research and resources, including technical assistance to other telehealth providers. The Center for Telehealth connects patients and caregivers to Medical Center health care providers remotely, in real time, using video calls and interactive tools. More than 500,000 patient visits in 69 of the state’s 82 counties have been recorded since the center began with just three sites, expanding to more than 200 sites today, not including the homes of patients. “UMMC’s selection as a national Telehealth Center of Excellence is affirmation of our mission and responsibility to bring high-quality health care to all Mississippians, especially those in rural, underserved areas,” said Dr. LouAnn Woodward, UMMC vice chancellor for health affairs and dean of the School of Medicine. The Medical University of South Carolina was also selected as a Telehealth Center of Excellence. Adcock said the designation allows the center to focus on four work areas: assessing the impact of telehealth on health care spending; creating new and/or refining payment methods; improving physician and patient awareness; and expanding its overall research portfolio. “While our center has been able to show some impressive outcomes, we have not had the staff to focus on researching telehealth delivery models and outcome comparisons,” Adcock said. The Telehealth Center of Excellence honor brings with it the responsibility to create a new knowledge base for telehealth through research, said Dr. Richard Summers, UMMC professor of emergency medicine and associate vice chancellor for research. The grant funding “will help UMMC to build the infrastructure for research in telehealth and allow us to bring a national leadership to this emerging special area of medical practice,” he said. The Center for Telehealth provides remote, on-site access to caregivers in more than 35 specialties, including urgent care, trauma, mental health, dermatology, cardiology, infectious diseases, and Alzheimer’s and dementia care. Pediatric telehealth specialties include remote concussion evaluation, cardiology, neurology, psychiatry, genetics and urology. Telehealth nurse practitioners are stationed in the emergency departments of 17 rural Mississippi hospitals to treat patients via a multidisciplinary team that includes a certified emergency medicine physician on the UMMC campus. 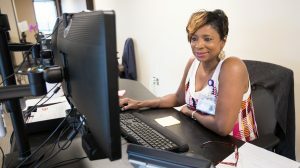 And, the center recently debuted its “UMMC 2 You” online minor medical care program offered throughout Mississippi to those who are on the state employee insurance plan and their families. It’s also offered through select schools and companies. “Our drive to address health care challenges with innovation is what has allowed us to be recognized as a leader in telehealth, nationally and internationally,” Adcock said.